Don't get me started Mark! LMAO.....You have to admit.....it was both fun and entertaining. 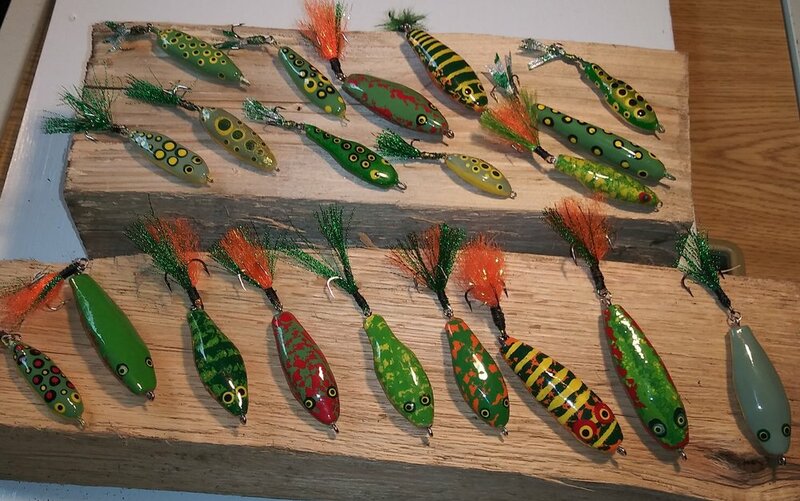 If I were you i would practice on an old lure. After trying a few different 2 part epoxies, I tried some Clearcast 7000 to seal up the lures and give them that nice glassy finish. I am surprised at the Gorilla Glue 2 part epoxy story, that 5 minute stuff seizes up quick... too quick! You have to race to get it on there before it turns into nose goblins. I've ruined a few nice lures that way for certain. Anyhow the Clearcast 7000 has been my salvation. Takes a while to cure, I leave the lures be for about 3 days then Im okay with handling them. Goes on thick but not so thick it sags, once you feel that brush skating along the surface, you know you have a good coat on. Really great stuff. Another great thing to do with a 2 part if its colder temps, put both bottles in a plastic bag then into a pot, with some warm water. Not boiling, but like bath water, let it marinate in there for a good 10 minutes, then it mixes more easily, and seems to glide on better once you start slathering it on. Hope this helps. Nope no lathe... it's deep winter here so instead of being on the rivers, I sit on a milk crate in the barn with some strong coffee and hand whittle these, then sand them. How long does it take to get the sanding done? Way too long. But till the dogwoods bloom I have ht etime to kill so why not. Nothing on TV anyhow, really. Usually one coat fixes it, on the clearcast. Some of them do need two coats, but its not abig deal, and the 2nd goes on so easy you can be a bit leaner with it.